Not all of us see beauty when confronted with aging bodies. But there’s little doubt that the photos of Anastasia Pottinger portray haunting and beautiful images of those who have reached the age of 100. In her new book of photos, 100: What Time Creates, you’ll find glorious and intimate portraits of life in its very late years. Read more about this work here. 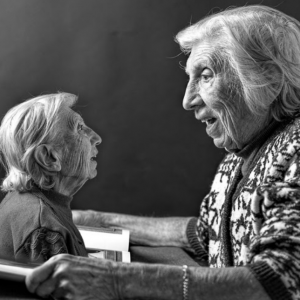 And for a truly wondrous look at the work of another photographer, Tony Luciani, whose 91-year-old mother with dementia became both his muse and companion in photography, you must watch his recent TED Talk here. After you wipe your eyes from watching his touching presentation, read more about Luciani’s brilliant photography and painting, and his mother Elia, here.